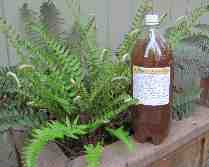 Worm compost products are shipped Mon-Fri at parcel post rate. Worm orders are shipped on Tuesdays by USPS Priority. Your Red Wiggler worm order must be received by the prior Saturday to shipping, if not it will be delayed by one week. The worms that you receive will be "bed run" which means that all age groups (breeders, juveniles and babies) will be included. Rather than shipping our worms in peat moss or coir, a pound of compost which the worms were harvested from, is used. This provides them with adequate moisture and food. Being familiar with this environment keeps them active and the compost provides start-up microbes for your new bed and even some worm eggs (cocoons) that will hatch between 2-7 baby worms. Sierra worms are collected "softly" (to avoid unnecessary stress). The reduction method consists of mounding compost from the bin under a light; the worms head for the bottom of the pile to avoid the light. After a few minutes, the compost is scooped off until worms are visible. The remaining pile is mounded again and more compost is removed. This procedure is repeated until there are only worms left. The worms, plus a pound of compost, are put in a breathable bag and boxed for shipping. Eisenia fetida, are available year-round to local residents. Shipping outside of California from July-August, when temps can go very high, makes shipping impossible until the weather cools in September. A brochure can be downloaded here to help you get your little "herd" settled in and ready to start work. * You should have your worm bin ready approximately a week before your worms arrive as this gives time for fermentation and growth of microbes to start working. It makes for an easier transition for your wigglers. * You must be available to receive your worms when they arrive; if you are unable to, we suggest that you use a work address for delivery. * If you would rather pick up the order at your post office, you must call ahead and request a "will call" and they will hold delivery for you. * Every effort is made to make sure your worm compost product or worm order is received in excellent condition, but accidents happen and I will replace an order free of charge if the fault lies with the carrier. * Please notify me within 24 hours from delivery if there is any problem with your order. 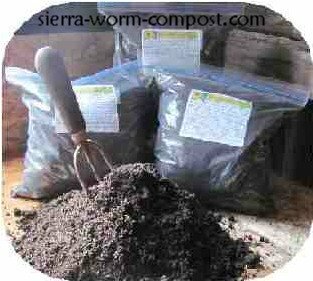 Our worm compost products are bagged as orders are received; we do not keep bagged inventory. The zip-lock bags are punched with several air holes before shipping so moisture does not build up. If you are redeeming a Get Growing coupon for 2 for 1 compost, order here. Our Wigglers' Brew is made using the active aeration method. Call for brewing day and time.